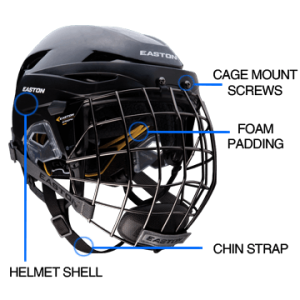 Quick answer: For the best concussion risk reduction, we suggest the Warrior Krown 360 which achieved the highest rating under the Hockey STAR assessment. Our runner-ups include the Bauer RE-AKT 75 and the CCM Resistance 300 helmet. 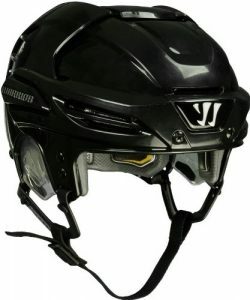 For a more budget friendly option, take a look at the Tour Hockey Spartan Gx Hocley Helmet (with cage). Having a properly fitted and well-designed hockey helmet is extremely important to reduce the chance of injury and concussion. Whether its for minor hockey, beer league or a higher level, concussions and head trauma can happen suddenly and unexpectedly. Hockey is a very fast sport and accidents happen frequently regardless of the intention. Getting hit, falling against the boards or skating into another player is a common painful occurrence and repeated injuries can cause lasting brain damage if you don’t have sufficient protection. We highly recommend looking for a hockey helmet that ranks high in concussion prevention whether it’s for yourself or your children. While no helmet can completely protect against head injuries and concussions, recent modern designs do a much better job at risk reduction. 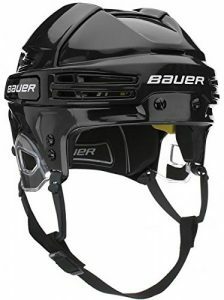 In this shopping guide we discuss what to look for and assess the current best hockey helmets based on the results of the Hockey STAR: Assessing the Biomechanical Performance of Hockey Helmets1 journal article from the Annals of Biomedical Engineering. Thanks for reading and keep your stick on the ice! Hockey helmets are built to be tough, light and prevent head trauma. You’ll likely be using this helmet for years so it’s important to understand your most important piece of gear (even more important than a jock!) and the protection it offers. This is the one piece of hockey gear we recommend you don’t cheap out on. Starting off, no you should not buy a used helmet. Certifications are void on resale and the protection and foam can be worn down or damaged without having visible signs. Usually made from a combination of plastic and composite material, the shell will protect your head and deflect impacts. 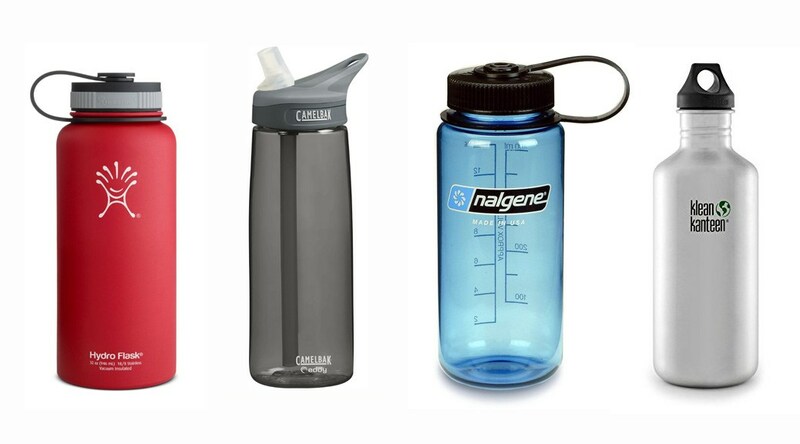 Each brand has their own designs that effect protection and air flow. Colors do not effect the quality of the helmet. Most helmets have a combination of Expanded Polypropylene (EPP), Dual-Density Vinyl Nitrile (VN), FXPP or PORON XRD foam. The foam used depends on the brand and model of the helmet. Higher end models offer more protection with a high-density, harder foam to absorb shock and a softer foam to provide cushioning for your head. Together they provide For example, according to Bauer, “PORON foam dissipates more than 90% of force on impacts”. Hockey helmets aren’t just for protecting your brain and skull. Your ears need protection too! 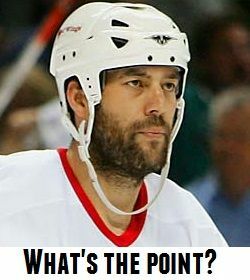 I’ve seen players get their ears split open from getting hit with a puck. Helmets come with an ear protector but many hockey players like to remove them for better comfort, better hearing and to make the helmet slightly lighter. Don’t do this! Getting hit in the ear hurts an incredible amount and you don’t want a nasty scar. More advanced helmets have occipital locks that cup the back of the skull below the occipital ridge. This helps to keep the helmet in place during a hard hit when you could bounce the back of your head off the ice. Usually there is a dial or slider you can adjust to tighten the hold. These days almost all helmets are adjustable in some way. Many models allow you to make adjustments by simply unlocking the sides or back via a switch with just your hand. This allows you to expand the helmet’s width or length by pulling or pressing while its unlocked. Usually when fitting a helmet, people will expand the helmet to its maximum size, try it on and tighten the width and length until it is snug. Don’t let them hang too low! Chin straps are there to prevent your helmet from coming off your head if you fall or get hit. The chin strap should have a space of no more than two fingers from your chin. If it’s too loose or not snapped on it can be very dangerous. Most referees and leagues won’t let you play without a proper chin strap. in the face, teeth or eye from a stray puck or high stick that left serious damage. Unless you’re being paid to play and have full dental coverage for a new set of teeth, I would strongly recommend playing with a full cage. While I do recommend a cage, I have some friends who simply can’t stand wearing one. They opt for wearing a visor instead. A good visor will provide reasonable eye protection but it won’t protect your teeth or mouth. It depends on the type and intensity of hockey you’ll be playing and the risk level you’re willing to accept. 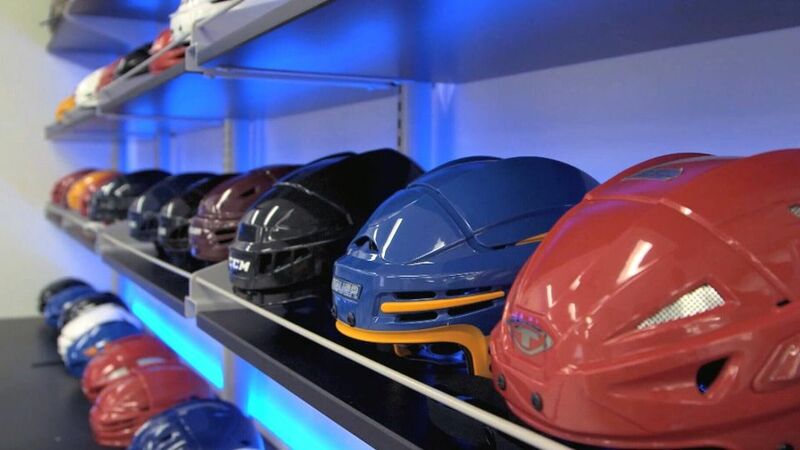 All hockey helmets come with a certification from HECC (Hockey Equipment Certification Council) and/or the CSA (Canadian Standards Association) that validate equipment for use in sports until the given expiry date. These two certifications are legally required to play in any minor hockey or beer league in the USA or Canada and must not be expired. They indicate that the equipment has passed specific performance criteria and testing to ensure they protect the areas they were designed for.2 If you take the stickers off or they are expired, referees and your hockey league will prevent you from playing. These stickers also cannot be purchased anywhere and must come certified with the helmet. 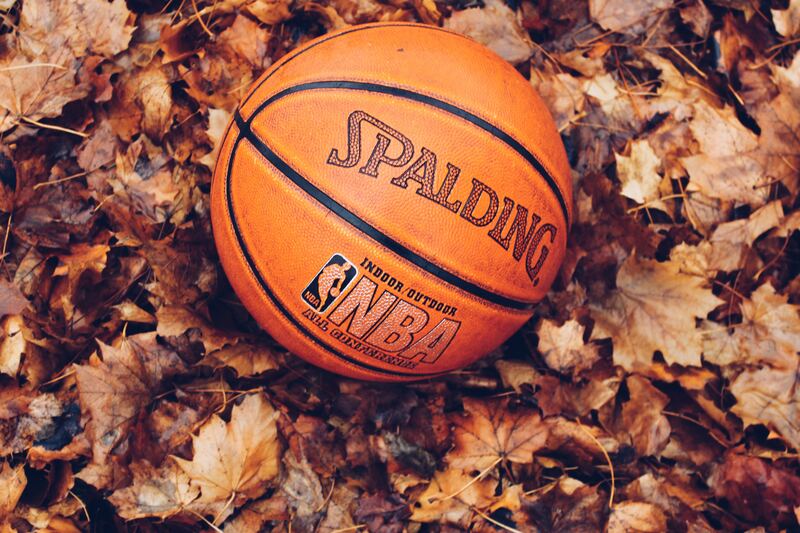 Finding the right size and fit is important so the shell and foam can properly dissipate energy on impact. A helmet that is too large, for example, can result in the helmet rattling and bouncing off your skull instead of absorbing energy. The helmet should fit tight and shouldn’t shake or feel loose when you move your head up and down or side to side. Most modern helmets now have tool-free adjustment so you can change the width and length to match your head shape. The top of the helmet should be on or just above the brow line and feel snug around the crown, temples and forehead. There shouldn’t be any gaps to allow movement. The cage, chin cup and chin strap should also all be comfortably snug. The chin strap should be a maximum two fingers below the chin so that your helmet doesn’t fly off when you fall or get hit. Most helmets only come in small, medium and large and you probably already know your size. Make the appropriate adjustments to make it snug without discomfort, and don’t let your chin strap hang too low! The primary function of a helmet is to prevent blunt head trauma and skull fractures. Only in recent years have concussions started to be taken more seriously. As research has progressed, it has been found that fast linear and rotational accelerations are highly correlated with most concussions. As a result, manufacturers have begun to design more advanced helmets to better manage impact energies to decrease head acceleration. But even with the best protection, no helmet is concussion proof and any player can sustain a head injury in any sport. That being said, our hockey helmet recommendations are based upon mitigating damage from concussions. 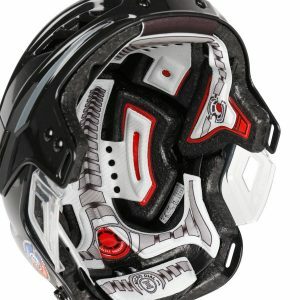 Warrior currently has the highest ranked hockey helmet for minimizing risk of concussion. This is the Warrior Krown 360. 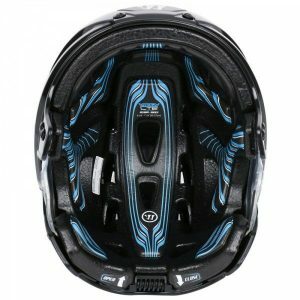 This helmet has a four piece shell that meshes with the liner to create a snug fit and maximum protection. There are three foams used, EPP foam for the structure (absorbs heavy impacts), Impax foam for the occipital and temple areas (absorbs lower impacts), and memory foam for comfort (this is the yellow and black foam inside). A single dial at the back allows for tool-free adjustment to lengthen/shorten or widen/narrow the helmet (known as the 4-Play Adjustment System). The outside shell is vented to improve air flow. This is a well-designed helmet that we fully recommend. The second highest ranked Warrior helmet is the Warrior Krown LTE. If you can’t find the Krown 360, go with this helmet. It has a very similar design with the same four piece shell and liner design. The main difference between the Krown LTE and Krown 360 is that the LTE does not have Impax foam. Everything else is virtually the same, except the LTE fits with a lower profile. Bauer has two main adult lines Bauer RE-AKT and Bauer IMS. 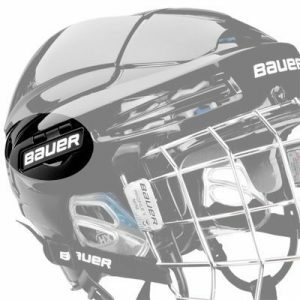 Of their entire lineup, the helmet that offer’s the best protection is the Bauer RE-AKT 75. 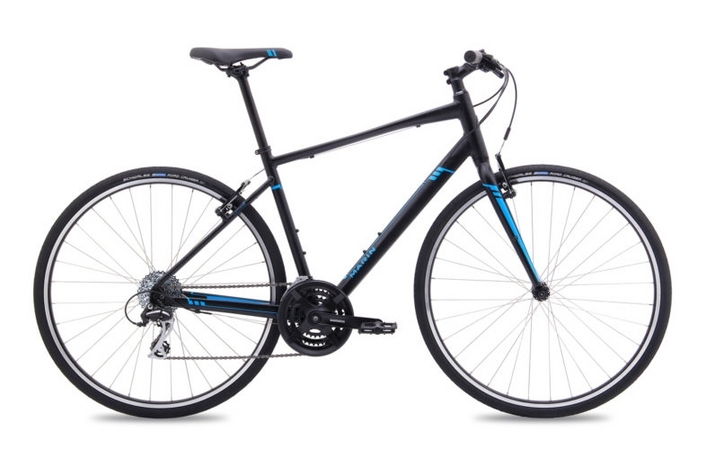 It has been designed to offer professional protection with a sleek modern design. Seven+ Technology foam is used in cylindrical structures to better absorb high impacts in key areas. A multi-density foam liner is used to reinforce the XRD foam inserts which can absorb impacts of different levels. A suspended liner allows a perfect comfortable fit while an occipital lock at the back helps to secure the skull. This helmet offers elite protection for anyone. CCM has come out with two new lines, CCM FitLite and CCM Resistance. 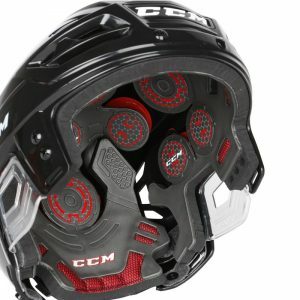 Of these two lines, the best CCM helmet for concussions is the CCM Resistance 300 helmet (with cage). 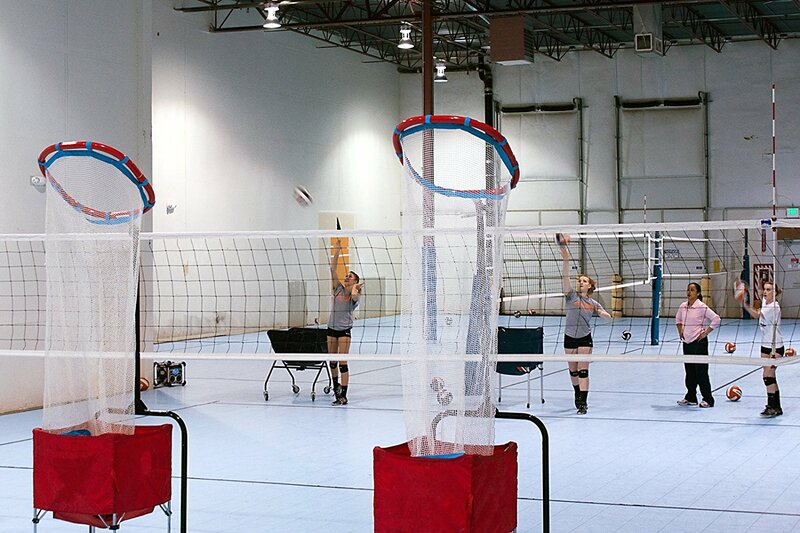 It was specifically designed to handle multiple types of impacts by using a patented R.E.D. System and multi-density foam liner. This R.E.D. system includes liquid-filled bladders to slow rotational acceleration of your head and helmet during hits. On top of the bladders are gel pads in different sizes and locations to slow linear acceleration. Combined with EPP foam the helmet does offers protection that is unique. Another helmet that is less expensive but still offers excellent protection is the CCM Resistance 100 helmet (with cage). While it is considered the lowest model in the Resistance line, the multi-density foam and well-designed shell structure works well to dissipate and dampen impact energy. The CCM FitLite 3DS is another excellent helmet that focuses on being lightweight and offering professional protection. 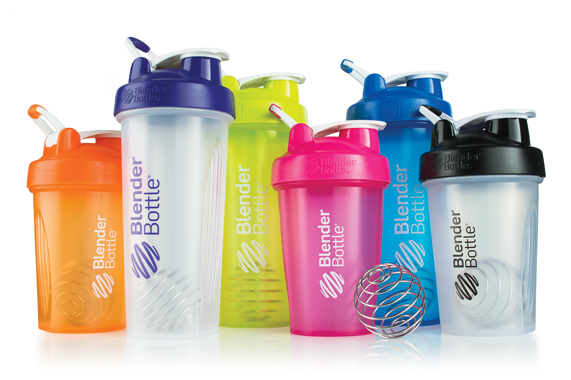 It has a two tone high-density PE shell with an ABS subshell and EPP foam liner. 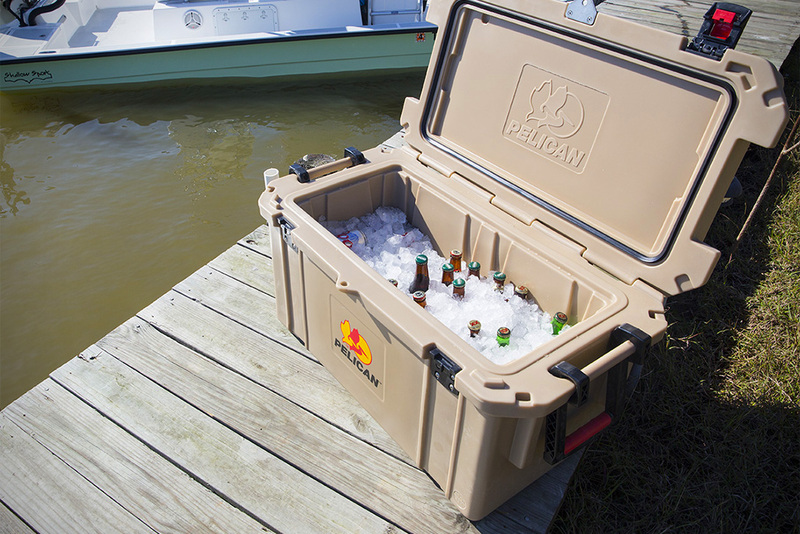 It also makes use of D30 smartfoam that reacts differently to low impact and high impact hits. This is a well-made and designed helmet. 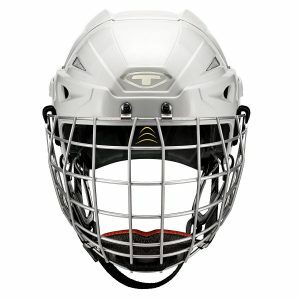 Tour Hockey isn’t as a well-known brand, but their Tour Hockey Spartan Gx Hocley Helmet (with cage) offers excellent protection at a very reasonable pricepoint. 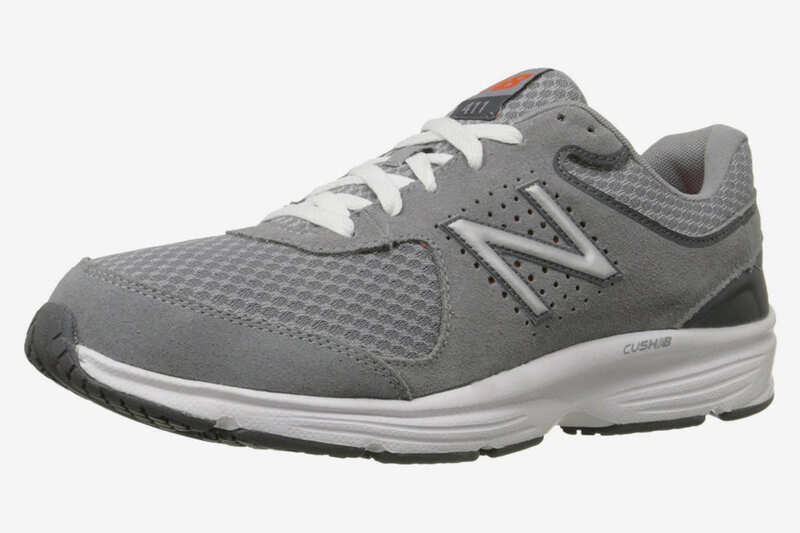 They are lightweight and comfortable with dual density EVA foam liner and adjustable sizing for a comfortable fit. There is lots of padding without feeling too bulky. A great alternative to the traditional big brands. It is always useful to keep a helmet repair kit in a pocket inside your bag. You should occasionally be tightening up or checking screws that will start to loosen up over time. This includes both your helmet and your ice skates. Multiple times I’ve found screws on the ice that I have no idea whose helmet or skate they came from. 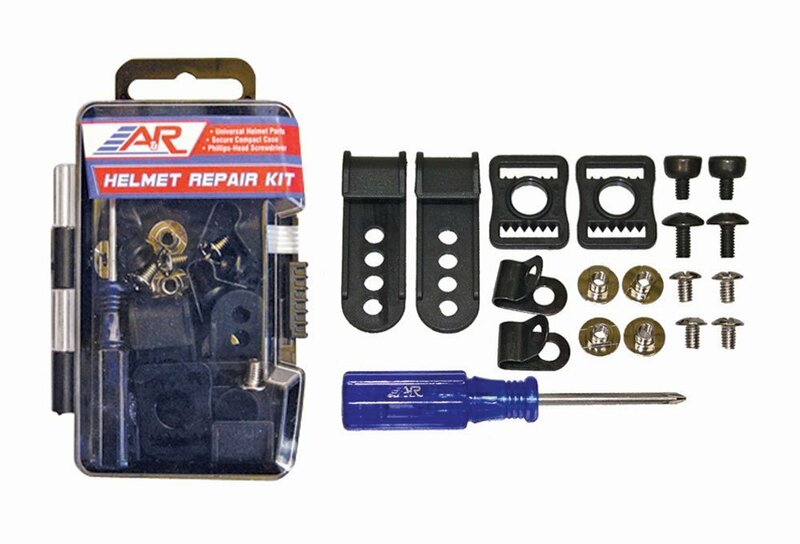 These kits are inexpensive and include replacement pieces and screws for your helmet. I guarantee you’ll need to use this at one point or another. One trick we’ve found for dealing with sweat and for reducing fog build-up on visors is the No Sweat Hockey Helmet Liner. It is currently used in the NHL by every referee! You essentially peel it off and ‘stick’ it to the front inside of your helmet where your forehead will be. 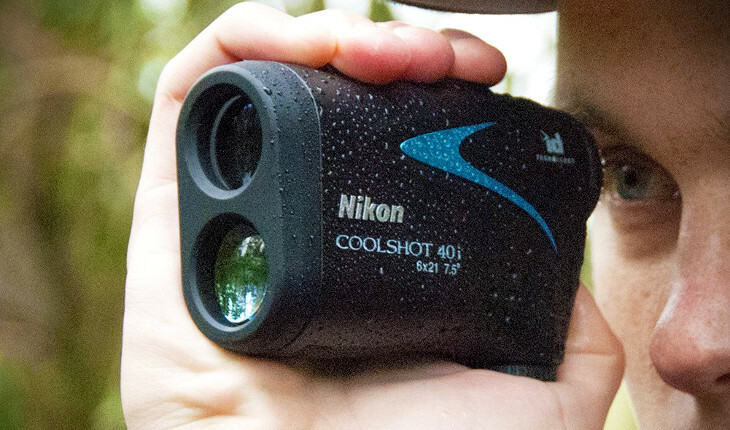 It soaks up dripping sweat and keeps it from getting into your eyes and burning or blurring your vision. A side effect is that it reduces fog buildup on glasses and visors. It is also thin, soft and lightweight and will absorb any odor. The universal design fits any helmet or hat and is made in America. 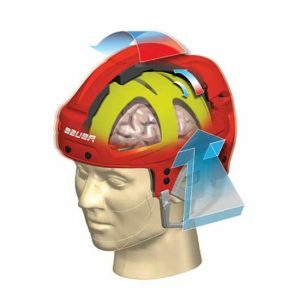 Hockey STAR: A Methodology for Assessing the Biomechanical Performance of Hockey Helmets, Annals of Biomedical Engineering, 2015, Volume 43, Number 10, Page 2429. Bethany Rowson, Steven Rowson, Stefan M. Duma.